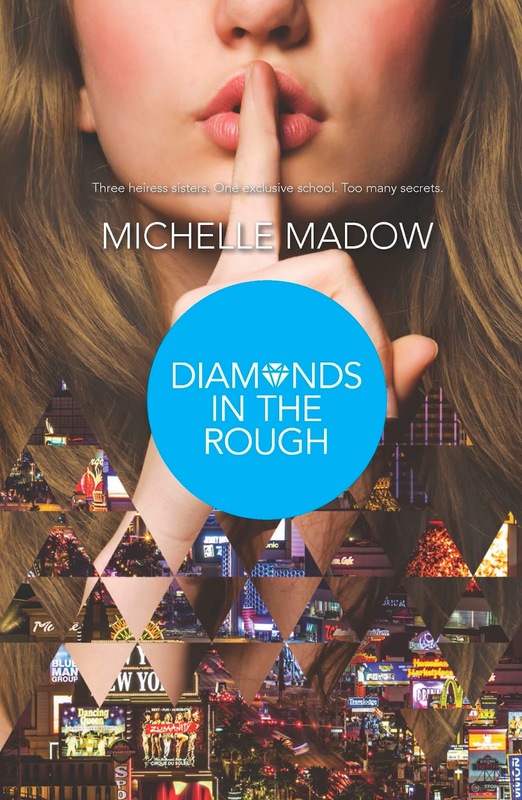 Diamond in the Rough picks up at the beginning of the school after The Secret Diamond Sisters leaves off in the summer. Serious this book is action packed with drama and even though I knew some things were coming, I didn’t always know what was coming. Michelle Madow definitely throws you through some serious loops that will keep you on your toes and speeding through. Once again we have the perspective of the four girls and I love how we see them change and develop, not only by reading it from them but also seeing them through each others eyes. I felt like I really bonded with Savannah in Diamonds in the Rough. In The Secret Diamond Sisters I remember often times finding her annoying but only because she acted like a young person trying to fit in. I think I didn’t give her enough credit and I think that she is getting shown in a different light. She wants to fit in, like most teenagers but she is also very aware. More than I think I thought she was in the beginning. She has a heart to heart with Damien of all people, that really put her in perspective for me. She’s still going to make mistakes and do stupid things but the thing about Savannah is that I think her heart is pure. Peyton...oh Peyton. I still can’t decide if I like her or not. She’s not bad and she’s not as resist to everything as she was in the first book. Some of her choices are kind of off kilter but it’s good to see she actually has a conscience about them as well. She seems to have a need to be loved and where Savannah seeks it through attention, Peyton looks for it to come from a certain person. Yet she seeks people who are unattainable so she doesn’t really have to make a commitment. It feels like nothing seems to ever really go her way. Dear little Courtney, she sometimes reminds me of me. Her parents or in this case Adrian and Rebecca don’t need to ground her or yell at her. Their disappoint is punishment enough for her. I so desperately wanted Courtney to take a chance on her love life, she works so hard in so many ways but I could see why she was scared. She learned to not be a throw caution to the wind girl because someone has always been counting on her. Even though Peyton wears her heart on her sleeve about their mom, I think Courtney has the most issues with her. She always feels like she is a bit disconnected and some things come to light about the past that definitely sheds some perspective on things. It’s hard to root for the bully usually but Madison is almost a different kind. This book she has toned down her hate for the sisters and I think it becomes obvious that even though she is kind of a mean girl. There is actually more to her. She has some serious drama in the beginning that turns her world upside down and then things really change for her. She really changes and by the end of the book, she reminds me a little bit of Peyton. I loved the book. This is such a great teen drama and the setting of Vegas leaves you so many different opportunities. I like that you see the characters changing and learning as they go along. I also really enjoyed the plot and I’m so anxious for the next book. How you can you leave me like that. As always the campus buzz is a nice a touch. It gives you yet another perspective because it’s fellow students commenting about the events going on in the book. If you enjoyed the first book then you will definitely not be disappointed in Diamonds in the Rough. The books keep getting better and I think the next book is going to be a whammy. I can’t wait!